An ‘impressive’ heat difference between the blocks has been found at four of Egypt’s pyramids, including the famous Great Pyramid of Giza, researchers say. The finding has been uncovered by a project aiming to penetrate the secrets of the pyramids. An international team of architects and researchers from Egypt, France, Canada and Japan is taking part in a scientific project called Scan Pyramids, launched on October 25 by the Egyptian Antiquities Ministry. 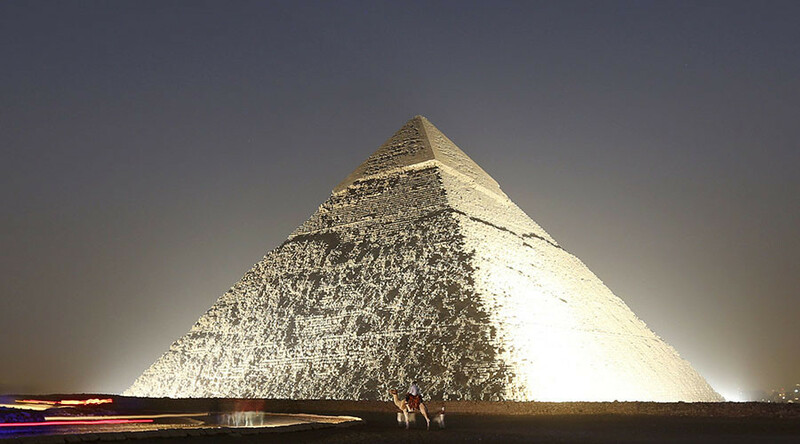 The team uses technology such as infrared thermography to scan and map the pyramids of Giza and Dahshur, according to the Egyptian authorities. Thermal scanning of the monuments has found that some of the limestone blocks were hotter than others. “Khufu will offer us today one of its secrets,” Egyptian Antiquities Minister Mamduh al-Damati told reporters. However, neither he nor the researchers provided any explanation for the heat anomalies, which could possibly imply the presence of a hidden chamber inside Khufu’s pyramid. Researchers expect more discoveries to come, as the project will continue until the end of 2016. Khufu’s pyramid, also known as the Great Pyramid of Giza or the Pyramid of Cheops, was built by the founder of the fourth dynasty (2,575-2,465 BC), and is the oldest and tallest of the three pyramids in Giza. It is also the oldest of the Seven Wonders of the Ancient World, and the only one to remain largely intact.